Rockside is a log constructed cabin that fronts a massive rock formation in the scenic hills of Hocking County. A gently flowing creek runs between the cabin and rock. The cabin features a porch facing the creek and rock formation where the hot tub is located. There is a charcoal grill and firepit located near the creek as well. The interior of the cabin is tastefully decorated and has a fully functional kitchen, (with silverware and pots and pans provided); living room, dining area and bathroom, (with towels provided) on the main level. There is a impressive stone fireplace with a gas insert which can be seen in the photgraph above. Rockside has a large flatscreen TV with Directv and blue ray / DVD player. 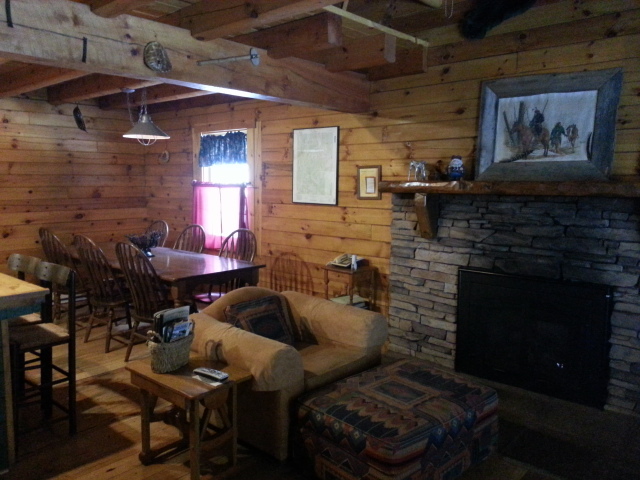 This cabin has broadband internet with WIFI service. The second level has two private bedrooms; one has a queen sized bed and the other has one full size and a set of bunk beds. The cabin sleeps six. Copyright 2014 Hocking Hills Scenic Retreats, LLC. All rights reserved.